The dried parts of medicinal herbs are susceptible to the infection of fungi during pre- or post-harvest procedure. This study aimed to investigate the presence of fungi and their metabolites mycotoxins on the surface of medicinal herbs collected from China. Forty-five retail samples of 15 different medicinal herbs were collected from 3 different regions in China. Then the potential fungi were immediately washed off from the surface of each sample with 0.1% Tween-20 followed by incubation of the rinse on petri-dish with potato dextrose agar containing chloramphenicol at 28 °C. The obtained fungi were isolated as single colonies and then characterized by morphology and molecular identification using internal transcribed spacer (ITS) sequencing with extracted DNA. Meanwhile, the mycotoxin-producing potential of the isolates was studied by liquid chromatography-tandem mass spectrometry (LC-MS/MS). A total of 126 fungi were identified from the surface of samples by morphology and ITS sequencing, with Aspergillus and Penicillium genera as the predominant contaminants. The mycotoxin-producing potential analysis showed that 6 of 8 A. versicolor isolates could produce sterigmatocystin. All 3 A. aculeatus isolates produced ochratoxin A, but only 1 of 3 A. flavus strains produced aflatoxins B1 and B2 without G1 and G2. Although the sample contamination ratios were high (≥95.6%), there was no significant difference (χ 2 = 1.05, P = 1.0) among the samples from 3 regions, which demonstrates the prevalent fungal contamination in the herbal medicines. The prevalent contamination phenomenon of fungi and high potential risk of sterigmatocystin and ochratoxin A were observed in 45 medicinal herbs collected from China. With the popular and extensive use of medicinal herbs all over the world, safety issues related to the contamination with microbial organisms has become a major concern [1–4]. Most of fungi are toxigenic in nature, and some other non-toxigenic species may impart a mouldy odour and taste . In the pre-harvest stage, medicinal herbs are susceptible to indigenous fungi in the soil where they were grown. The dried part of medicinal herbs may be exposed to fungal contamination during post-harvest. Different taxonomic groups of fungi were detected in medicinal plant samples collected from different regions, suggesting Aspergillus and Penicillium groups as the most predominant genera [6–8]. Many species of Aspergillus and Penicillium genera are known mycotoxin-producers, which may pose a great threat to public health . Mycotoxigenic fungi could produce a wide variety of mycotoxins. Aflatoxins (B1, B2, G1, and G2) are a family of structurally related toxic secondary metabolites which mainly produced by certain strains of Aspergillus flavus (A. flavus) and Aspergillus Parasiticus (A. parasiticus) [9, 10]. Aflatoxin B1 (AFB1) was classified as a Group I carcinogen by the World Health Organization for Research on Cancer in 1993 . Sterigmatocystin (ST), the stable intermediate in the final steps of aflatoxin biosynthesis in the aflatoxin-producing fungi A. flavus and A. parasiticus, was proven to be another carcinogenic mycotoxin . Some certain stains, e.g., A. versicolor, A. sydowi, A. nidulans, Bipolaris, Chaetomium and Emericella spp. could also produce ST [13–16]. Produced by P. verrucosum, P. nordicum and A. carbonarius [17–19], another mycotoxin ochratoxin A (OTA) could cause a series of adverse effects in animals and humans, including teratogenicity, immunotoxicity, genotoxicity and mutagenicity [20–22]. This study aimed to investigate the presence of fungi on the surface of 45 medicinal herbs samples of fifteen herbs collected from Hunan, Hubei and Guangxi Province, China, by the characterization of morphology and ITS sequencing, followed by analysis of mycotoxigenic potential of isolated fungi using LC-MS/MS for the measurement of AFB1, AFB2, AFG1, AFG2, ST and OTA. Standard solutions of AFB1, AFB2, AFG1 and AFG2, and OTA and ST powder standards were purchased from Supelco Sigma-Aldrich (St Louis, MO, USA). Potato dextrose agar (PDA) with chloramphenicol (0.1 g/L) was obtained from Huan-Kai (Guangzhou, China). LC-grade acetonitrile and methanol were bought from Merck (Darmstadt, Germany). Ultra-pure water was obtained from a Millipore Q system (Millipore, France). The other reagents were of analytical grade and bought from local producers. Fifteen kinds of most commonly-used medicinal herbs (Table 1) were chosen for analysis. During July and August of 2010, about 30 g of each kind of medicinal herb were purchased from a random herbal medicine store in Hunan, Hubei and Guangxi province (China), respectively. The herbs were authenticated by an experienced pharmacist for traditional Chinese medicine according to Chinese Pharmacopeia . Each sample was instantly put into a sterile polythene bag, sealed properly, shipped to the laboratory and stored at 4 °C prior to use. The detail information of each sample was given as Additional file 1: Table S1. The samples were processed as soon as possible to avoid second contamination. Five grams of each sample (2.5 g was used for flower samples) was mixed with 30 mL 0.1% Tween-20 and vortexed (Vortex-5, Qilinbeier, China) for 3 min. Then the mixture was filtrated through a disposable syringe with sterile cotton and the filtrate was centrifuged (3-18 K, Satorius, Germany) at 2600×g for 10 min. After dissolving the pellet in 300 µL sterile 40% glycerol, serial decimal dilutions were performed. For incubation, 100 μL aliquots of each dilution were plated in duplicate onto PDA containing chloramphenicol (0.1 g/L), which were cultured at 28 °C for 7–10 days. Meanwhile, a sample without medicinal herbs was prepared in parallel and used as the negative control. The fungal colonies were then transferred to fresh PDA plates to obtain pure cultures, with 0.1% Tween-20 as negative control. The purified isolates were cultured with 1 or 3 point inoculations for 7 days on PDA at 28 °C. When the colony characteristics and pigment production were noted, the conidia and conidial head were observed microscopically (Smart, Optec, China) for morphological identification by lactophenol cotton blue stain. Taxonomic identification results were classified based on Manual of fungal Identification into Aspergillus, Penicillium and Fusicladium etc [24–27]. After the pure isolates were grown on PDA at 28 °C for 7 days, the mycelia were harvested. DNA extraction was performed using the Lysis Buffer for Microorganism to Direct PCR kit (Takara, Dalian, China) according to the manufacturer’s instructions. Fungal mycelium was added to 50 µL lysis buffer and incubated at 80 °C for 15 min. After centrifugation, the supernatant was collected and used as the polymerase chain reaction (PCR) template. Positive control was performed with the standard strain Aspergillus flavus NRRL3357. PCR amplification was performed in a 50 µL reaction prepared by mixing 25 µL 2× Power Pfu PCR Mixture (Bioteke, Beijing, China), 2.5 µL oligonucleotide primers (10 µmol/L) and 5 µL DNA template. Two pairs of primers (Table 2) were used to amplify ITS1, 5.8S and ITS2 in rDNA regions. The novel primers of Wen1-F and Wen1-R were designed according to the ITS sequences of Penicillium expansu (AJ005676.1) and P. janthinellum (GU565108.1). The amplification program was as follows: pre-denaturation at 95 °C for 5 min; 35 cycles of 30 s at 95 °C, 30 s at 55 °C and 1 min at 72 °C; and final extension at 72 °C for 10 min. The sequence analysis was performed at Huada Co. Ltd. (Guangzhou, China) and the sequencing results were analysed with the BLAST program of the National Centre for Biotechnology Information (NCBI) by searching NCBI nucleotide database (RRID:SCR_004860) for identification of the genus and species of the isolates. The assay was to aim to determine AFB1, AFB2, AFG1, AFG2, OTA and ST. Therefore, only the potential producer,according to literatures, were screened and the other 16 strains were excluded. Among the total isolates obtained from the samples, 110 strains potentially producing 6 mycotoxins were grown in Sabouraud dextrose medium (SD) at 28 °C for 10 days. Then 5 mL the culture broth was extracted with ethyl acetate followed by dichloromethane  and the organic layers were combined and then evaporated to dryness. After that, the residues were dissolved in 1.5 mL ethanol and injected into liquid chromatography-tandem mass spectrometry (LC–MS/MS) for determination of AFB1, AFB2, AFG1, AFG2, OTA and ST. Meanwhile, the standard strain Aspergillus flavus NRRL3357 were used as positive control. Liquid chromatography separation of 10 µL sample was performed on a Hypersil GOLD C18 (100 × 2.1 mm, 3 µm) column. The mobile phase consisted of (A) water containing 4 m mol/L NH4Ac–0.1% HCOOH and (B) methanol and the flow rate was 300 μL/min. A gradient elution program was applied: 0‒10 min, 20‒85% B; 10‒15 min, 85‒100% B; 15‒20 min, 100% B. The mass spectrometer was operated in the ESI+ mode using selective reaction monitoring (SRM). High-purity nitrogen was used as the drying and ionisation gas. Argon was used as the collision gas for collision-induced dissociation. The capillary voltage was set at 3.50 kV and the capillary temperature was 350 °C. The SRM transitions used to detect mycotoxins were listed in Table 3 and chromatograms of 6 mycotoxins in standard solution and representative samples were showed in the Fig. 1. Software RStudio (R version 3.2.2)  was used for the data analysis, where the comparison of fungal contamination ratios was performed by Pearson’s Chi squared test with simulated P value (based on 2000 replicates). The association between fungal species and herbal medicines is not fully understood due to the complicated contamination causes including extrinsic (environmental and geographical) and intrinsic (constituents of each herbal species) factors [30, 31]. Forty-five samples of 15 common medicinal herbs were investigated in this study to reveal the main contaminating fungi and provide some relevant references for quality control on medicinal herbs in China. In this study, morphological analysis as well as molecular identification using ITS sequencing were applied to analyse fungal diversity. As not all the strains could be amplified by the primer pair ITS1/ITS4 , a novel primer pairs Wen1F/Wen1R were designed for the ITS regions of the fungi by Primer-BLAST of NCBI (Table 2). A total of 126 isolated strains were successfully amplified. It is notable that the primers of Wen1F/Wen1R tended to be biased towards the amplification of Aspergillus and Penicillium, which agreed with the view on the potential primers bias during PCR in fungal diversity exploring . As a result, 126 strains were isolated (Table 1) illustrating the two main genera identified were Aspergillus (28 isolates) and Penicillium (35 isolates). Among of 28 Aspergillus recovered, A. versicolor (8 strains) was the dominant species, followed by the A. fumigatus (4 strains), A. aculeatus (3 strains) and A. flavus (3 strains). Other members of the Aspergillus group were detected at lower level. 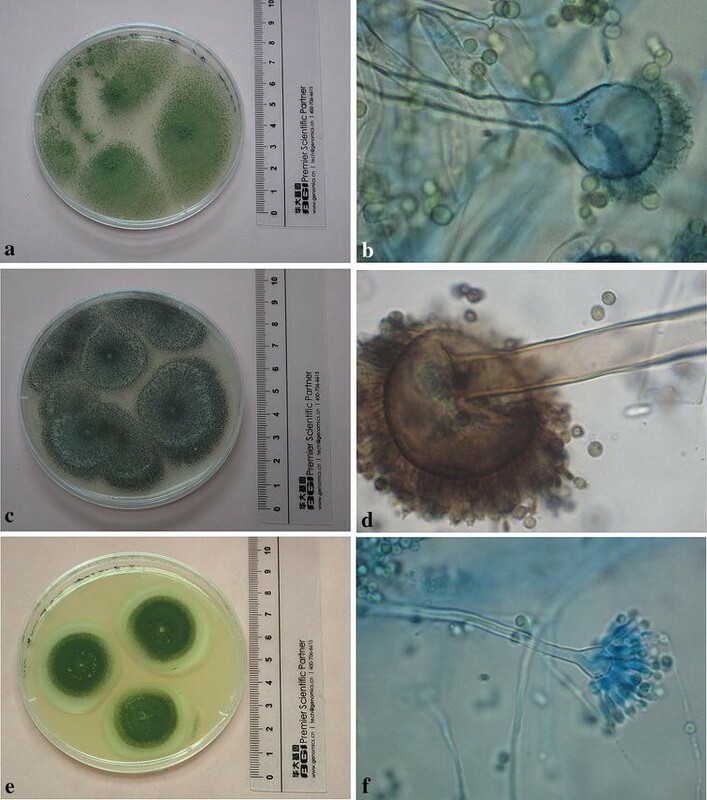 The colonies and microscopic morphologies of A. flavus, A. aculeatus and A. versicolor isolated from Fructus Lycii, Radix Angelicae Sinensis and Radix et Rhizoma Glycyrrhizae, respectively, were shown in Fig. 2. Although the average of fungal contamination ratio (95.6%) are extremely high in 45 samples collected from 3 places (93.3, 93.3, 100% for samples from Hubei, Hunan and Guangxi, respectively), Pearson’s Chi squared test indicated there is no significant difference among 3 groups by P = 1.0. This further proved the prevalent fungal contamination phenomenon across the collected herbal medicine and should rise our attention. Overall, the observation of Aspergillus and Penicillium spp. as the most frequently contaminant was consistent with previous reports. Efuntoye  found that A. niger, A. flavus, F. moniliforme, Trichoderma viride, P. expansum and Mucor fragilis were the dominant species in sundried herbs. Roy et al. reported that 52% of 152 samples were contaminated with species from the Aspergillus genus, while Halt  found that the most predominant fungi detected in 62 samples of medicinal plant material and 11 herbal tea samples were Aspergillus and Penicillium. In comparison, fungi from other genera including Eurotium, Cladosporium was detected at a low incidence in this study, which was also consistent with the study from Song et al. . Cladosporium spp. is the common and widespread fungi on land and in air [36, 37]. Although there are no publications regarding its ability of producing toxin, they do produce odours likely relating to some volatile organic compounds. As documented in Table 3, the LC-MS/MS method showed an outstanding sensitive, with the limit of detection (LOD) from 1.56 to 25.00 ng/L determined in 3 times of the ratio of signal to noise (S/N). The data on the mycotoxin-producing potentials of the fungal isolates were presented in Table 4. Of the 3 A. flavus isolates, only 1 strain from Fructus Lycii produced AFB1 and AFB2 but not AFG1 and AFG2. The inability of the other 2 strains to produce aflatoxins might be a result of some mutation in the biosynthetic gene cluster of aflatoxins . Another mycotoxin ST, which was overlooked in many reports except a study of mycotoxins screening in medicinal herbs , presented in 6 of the 8 A. versicolor isolates by the analysis of LC-MS/MS. To evaluate human exposure to this mycotoxin and more importantly, monitor medicinal herbs for existing or future legal compliance, suitable and simple analytical procedures are necessary to precisely analyse it and its contamination phenomenon in these samples even all the medicinal herbs. Consistent to Blank et al. , all the A. aculeatus strains isolated in this study produced OTA. Although it has been reported that a number of Penicillium strains are OTA producers [17, 19, 41], none of 35 Penicillium strains in this study produced OTA, which has to be further confirmed. Moreover, the contaminant A. fumigatus still should not be neglected, even though neither the A. fumigatus, Cladosporium spp. strains nor the Penicillium spp. produced detectable mycotoxins. Because A. fumigatus is thermos-tolerant and has the ability to excrete hydrolytic extracellular enzymes that consequently allow opportunistic colonisation in lung tissue . The prevalent contamination phenomenon of fungi observed in 45 medicinal herbs collected from China and the mycotoxigenic potential of some fungal isolates suggested appropriate procedures should be engaged to protect medicinal herbs from being contaminated. HX conceived and designed the study and performed the data analysis. RSZ, WLW and JT performed the experiments, analyzed data and wrote the manuscript. RTZ and WWC collected, authenticated medicinal herb samples and revised the manuscript. All authors have read and approved the final manuscript. This work was financially supported by the Project Based Personnel Exchange Program between the China Scholarship Council and the German Academic Exchange Service, and the Science and Technology Project of Guangdong Province (Grant No. 2015A030401083). The authors thank Mr. Li Dingmiao and Mr. Chen Jiamin for their technical assistance and Miss Chen Huizhi for her comments on the manuscript. 13020_2016_124_MOESM1_ESM.docx Additional file 1: Table S1. Samples collection information and depositing numbers.